I’ve had a peculiar kind of awful realization after listening to a C++ talk earlier today. The speaker (Bjarne Stroustrup, actually) went over a few defining components of the language, before he took a much longer stop at templates. In C++14, templates are back in the spotlight because of the new constraints feature, intended to make working with (and especially debugging) templates much more pleasant. Everyone using C++ templates now is probably well accustomed to the cryptic and excessively long error messages that the compiler spits out whenever you make even the slightest of mistakes. Because of the duck typing semantics of template arguments, those messages are always exposing the internals of a particular template’s implementation. If you, for example, worked with STL implementation from Visual C++, you would recognize the internal __rb_tree symbol; it appeared very often if you misused the map or set containers. Its appearance was at best only remotely helpful at locating the issue – especially if it was inside a multi-line behemoth of an error message. Before constraints (or “concepts lite”, as they are dubbed) improve the situation, this is arguably the worst part of the C++ language. But alas, C++ is not the only language offering such a poor user experience. As a matter of fact, there is a whole class of languages which are exactly like that – and they won’t change anytime soon. Yes, I’m talking about the so-called scripting languages in general, and Python in particular. The analogies are striking, too, once you see past the superfluous differences. Take the before mentioned duck typing as an example. In Python, it is one of the core semantical tenets, a cornerstone of language’s approach to polymorphism. In current C++, this is precisely the cause of page-long, undecipherable compiler errors. You just don’t know whether it’s a duck before you tell it to quack, which usually happens somewhere deep inside the template code. But wait! Python et al. also have those “compiler errors”. We just call them stacktraces and have interpreters format them in much a nicer, more readable way. Of course unlike template-related errors in C++, stacktraces tend to be actually helpful. I pose, however, that it’s mostly because we learned to expect them. Studying Python or any other scripting language, we’re inevitably exposed to them at the very early stage, with a steady learning curve that corresponds to the growing complexity of our code. This is totally different than having the compiler literally throw its innards at you when you try to sort a list of integers. What I find the most interesting in this whole intellectual exercise is to examine what solutions are offered by both sides of the comparison. Dynamic languages propose coping mechanisms, at best. You are advised to liberally blanket your code with automated tests so that failing to quack is immediately registered before the duck (er, code) goes live. While some rudimentary static analysis and linting is typically provided, you generally cannot have a reasonable idea whether your code doesn’t fail at the most basic level before you actually run it. Now, have you ever unit-tested the template specification process that the C++ compiler performs for any of your own templates? Yeah, I thought so. Except for the biggest marvels of template metaprogramming, this may not be something that even crosses your mind. Instead, the established industry practice is simply “don’t do template metaprogramming”. But obviously, we want to use dynamic languages, and some of us probably want to do template metaprogramming. (Maybe? Just a few? Anyone?…) Since they clearly appear to be similar problems, it’s not very surprising that remedies start to look somewhat alike. C++ is getting concepts in order to impose some rigidity on the currently free-form template arguments. Python is not fully on that path yet but the signs are evident, with the recent adoptions of enums (that I’ve fretted about) as the most prominent example. If I’m right here, it would be curious to see what lies at the end of this road. In any case, it will probably have been already invented fifty years ago in Lisp. Many languages now include the concept of annotations that can be applied to definitions of functions, classes, or even variables and fields. The term ‘annotation’ comes from Java, while other languages use different names: attributes (C#), decorators (Python), tags (Go), etc. Besides naming disparities, those features also tend to differ in terms of offered power and flexibility. The Python ones, for example, allow for almost arbitrary transformations, while Go tags are constrained to struct fields and can only consist of text labels. The archetypal annotations from Java lie somewhere in between: they are mostly for storing metadata, but they can also be (pre)processed during compilation or runtime. Now, what about C++? We know the language has a long history of lacking several critical features (*cough* delegates *cough*), but the recent advent of C++11 fixed quite a few of them all at once. That’s misleading, though. Attributes are nothing else than unified syntax for compiler extensions. Until C++11, the job of attributes were done by custom keywords, such as __attribute__ (GCC) or __declspec (Visual C++). Now they should be replaced by the new [[squareBracket]] syntax above. So there is nothing really new about those attributes. At best, you could compare them to W3C deciding on common syntax for border-radius that forces both -webkit-border-radius and -moz-border-radius to adapt. Most importantly, there is no standard way to define your custom attributes and introspect them later. Both loginRequired and cached(...) are functions, tied together by app.get with the actual request handler at the end. They “decorate” that handler, wrapping it inside a code which offers additional functionality. Well yes, we actually can! Two new features from C++11 allow us to attempt this: lambda functions and initializer lists. With those two – and a healthy dose of functional programming – we may achieve at least something comparable. The Go programming language is was on my (long) list of things to look into for quite some time now. Recently, at last, I had the opportunity to go through the most part of a comprehensive tour of Go from the official website, as well as write few bits of some Go code by myself. We all like to put stuff into our various mental buckets, so let’s do that with Go too. 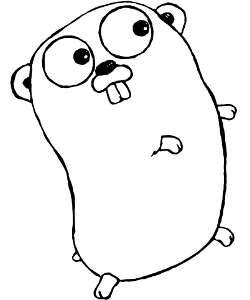 Go is a compiled, statically typed programming language that runs directly on the hardware, without any underlying virtual machine or other bytecode-based runtime. That sounds good from the speed viewpoint and indeed, Go comes close to C in raw performance of equivalent programs. Syntax of Go is C-like, at least in the fact that it’s using curly braces to delimit blocks of code. Some visual clutter is intentionally omitted, though. Semicolons are optional, for example, and idiomatic Go code omits them at all times. If you’re familiar with reasoning that suggests doing that in other C-like languages, you shouldn’t have much problems adapting to this requirement. As you can see, this also results in putting return type at the end of function declarations – something that e.g. C++ also started to permit. But shorthand variable declarations are not the only way Go improves upon traditional idioms of static typing. Its interfaces are one of the better known features here. They essentially offer the support for duck typing (known from Python, among others) in a compiled language. The trick is that objects do not specify which interfaces they implement: it’s just apparent by their methods. We can, however, state what interfaces we require for our parameters and variables, and those constraints will be enforced by the compiler. Essentially, this allows for accepting arbitrary values, as long as they “quack like a duck”, while retaining the overall type safety. and use it with anything that looks like something you could write into: file objects, networked streams, gzipped HTTP responses, and so on. Those objects won’t have to declare or even know about io.Writer; it’s sufficient that they implement a proper Write method. Talking about objects and interfaces sounds a bit abstract, but we shall not forget that Go is not a very high level language. You still have pointers here like in C, with the distinction between passing an object by address and copying it by value like in C++. Those two things are greatly simplified and made less error prone, however. First, you don’t need to remember all the time whether you interact with object directly or through a pointer. There’s no -> (“arrow”) operator in Go, so you just use dot (.) for either. This makes it much easier to change the type of variable (add or remove *) if there’s need. Second, most common uses for pointers from C (especially pointer arithmetic) are handled by dedicated language mechanism. Strings, for example, are distinct type with syntactic support and not just arrays of chars, neither a standard library class like in C++. Arrays (called slices) are also well supported, including automatic reallocation based on capacity, with the option of reserving the exact amount of memory beforehand. The i variable here (or more likely: the whole stack frame) will have been preserved on heap when function ends, so the pointer does not become immediately invalid. If you ever coded a bit in some of the newer languages, then coming to C or C++ you will definitely notice (and complain about) one thing: lack of proper package management. This is an indirect result of the header/implementation division and the reliance on #include‘ing header files as means of specifying dependencies. Actually, #includes are not even that: they work only for compiler and not linker, and are in some sense abused when working with precompiled headers. What about Go?… Turns out it does the right thing. There are no separate header and implementation units, only modules (.go files). Unless you are using GCC frontend or interfacing with C code, the compiler itself is also unified. But most importantly, there are packages and normal import statements. You can have qualified and unqualified imports, and you can alias things you’re importing into different names. Packages themselves are based on directory structure rooted in $GOROOT, much like e.g. Python ones are stored under $PYTHONPATH. The only thing you can want at this point is the equivalent of virtualenv. Note that it’s not as critical as in interpreted languages: standalone compiled binaries do not have dependency problems, after all. But it’s still a nice thing to have for development. So far, people seem to be using their own solutions here. I recently had a discussion with a co-worker about feasibility of using anonymous functions in Python. We happen to overuse them quite a bit and this is not something I’m particularly fond of. For me lambdas in Python are looking pretty weird and thus I prefer to use them sparingly. I wasn’t entirely sure why is it so – given that I’m quite a fan of functional programming paradigm – until I noticed a seemingly insignificant fact. Namely: the lambda keyword is long. With six letters, it is among the longer keywords in Python 2.x, tied with return, import and global, and beaten only by continue and finally. Quite likely, this is what causes lambdas in Python to stand out and require additional mental resources to process (assuming we’re comfortable enough with the very idea of anonymous functions). The long lambda keyword seems slightly out of place because, in general, Python keywords are short. Or are they?… Thinking about this, I’ve got an idea of comparing the average length of keywords from different programming languages. I didn’t really anticipate what kind of information would be exposed by applying such a metric but it seemed like a fun exercise. And it surely was; also, the results might provoke a thought or two. The newest incarnation of C++ seems to be losing badly in this competition, followed by C#. On the other side of the spectrum, Go and Python seem to be deliberately designed to avoid keyword bloat as much as possible. Java is somewhere in between when it comes to sheer numbers of keywords but their average length is definitely on the long side. This could very well be one of the reasons for the perceived verbosity of the language. For those interested, the exact data and code I used to obtain these statistics are in this gist.